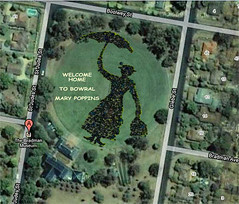 Did you know that the creator of Mary Poppins, the world's most loved nanny, lived in Bowral? There is mounting evidence that PL Travers actually came up with the idea for the magical Miss Poppins some 100 years ago when she lived in Holly Street, just a few doors down from a young Don Bradman and nearby to Bowral's famous Bradman Oval. SHYAC is leading the campaign to have Bowral recognised as the Birthplace of Mary Poppins and have a statue erected at Bowral's world-famous Bradman Oval and has set up a special trust fund just for this purpose. We conducted a world-wide vote for the preferred Mary Poppins statue design in 2010. The chosen design is by Australian sculptor Tanya Bartlett. More information at the Mary Poppins Birthplace page on Facebook and the dedicated website. Check out this Channel 7 Story featuring Bowral! Become a Platinum, Gold, Silver or Bronze business sponsor. Find out about the costs and benefits by downloading a PDF. Register as a Mary Poppins supporter to receive more information. Use the donate button below to contribute to the statue (donations over $2 are tax deductible).